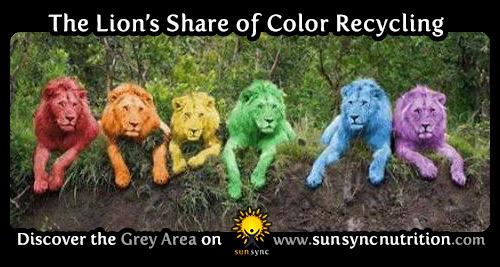 Subscribers to Sun Sync Nutrition have access to a Color Recycling video. I talk about it in hour 1 (±0:32) of the May 4, 2015 interview on ORN. I have a (private) video of Adano Ley recycling a psychologist through all these colors one time for each of the seven endocrine centers while the psychologist was hooked up to a brain wave scanner. He turned the psychologist's previously busy brain completely "off" except for a trace of delta in his right hemisphere. A close friend (one of Adano's students) went through one or two cycles and threw away her eyeglasses. Her clients had powerful emotionally-charged experiences. A cat's purr (25 to 150 Hertz) grows bone and heals bone. It's generated from a neural oscillator in a cat's brain. For maximum results, listen to the purring while eating. I talk about it in hour 1 (0:52:30) in the May 2015 interview on ORN and from ±08:00 in the Dec 2008 interview on ORN. "Living to live is all there is. We don't go get immortality; we are immortality."